The New Photometer 7100 is fully integrated with the Palintest system of water analysis. It offers a great value instrumental analysis for an extensive range of water tests. The photometer 7100 accurately assesses the colour formed in the test sample and displays the readings directly in concentration units on its large LCD screen – no more inaccurate results due to variation in operator eyesight or lighting conditions. Not only does the 7100 have the whole range of Palintest tests available, but is highly portable, and rugged in design. Its full IP67 rating means it is fully waterproof and ideal for on-site testing in any application. The unique adaptive cell holder automatically adjusts to the tube size, and accommodates any size vial with no adapter needed. The instrument interface comes with 5 languages built in, and a large easy to read backlit display with easy to navigate menu. 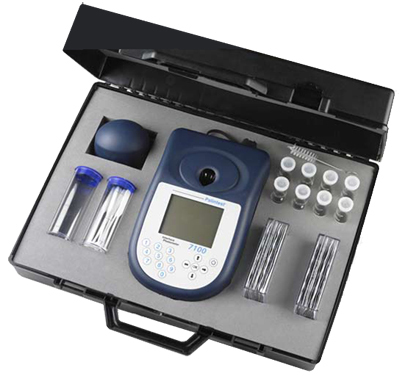 The Photometer 7100 is part of the successful and versatile Palintest water test system. It is supplied in a carrying case designed to carry the instrument, and your choice of reagents to provide a complete all-in-one on-site analysis kit. The photometer is fully integrated with the whole range of Palintest water tests and uses light to measure colour changes in water samples treated with a reagent. It is accurate to ±0.005 at 0.3 absorbency units (au) and resolution is 0.001au, removing the inaccurate results that using a comparator colour chart can give due to variations in operator eyesight or lighting conditions. The sample is simply placed in the unique adaptive cell holder and a button pressed. The cell holder automatically adjusts to any round tube size. The 7100 features automatic light wavelength selection for each of the pre-programmed test methods. It has easy-to-navigate menus, and the software also remembers the most recent tests, making it even quicker to use next time. Sealed to IP67, the unit runs on standard AA batteries.